I am wondering how many Wing Chun/Ving Tsun practitioners in Taiwan have read above Ving Tsun Athletic Association Codes, a.k.a, Ip Man Codes of Conduct before. I bet majority of them haven't even heard of it. Some say the Ving Tsun Athletic Association Codes, a.k.a, Ip Man Codes of Conduct were passed down by Grandmaster himself. But, I also heard the Codes were written by one of Ip Man’s good friends who was really good at writing. I know some Wing Chun schools in the U.S. have their students memorize the English version of the Codes and some even have a test on it. I don’t know how many of those Wing Chun practitioners really agree with and abide the Codes. However, for nothing else, it is not a bad thing for practitioners of Wing Chun to have a taste of the Chinese culture. 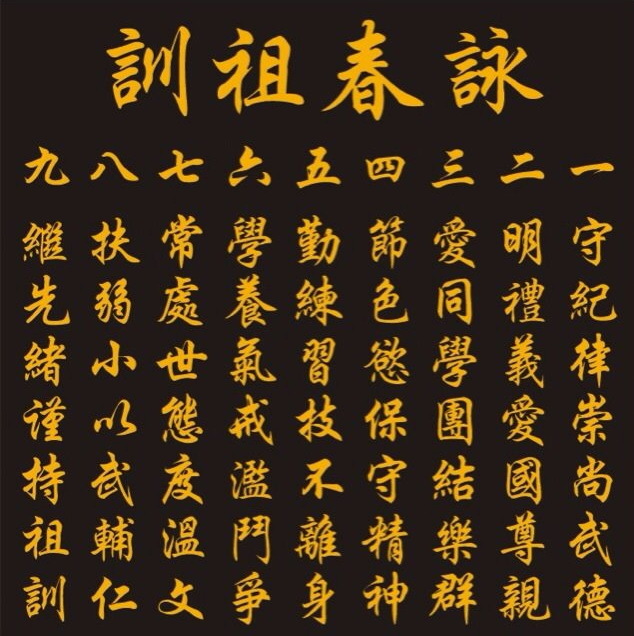 We here at “Taipei Wing Chun” also has a set of codes; although we don’t require students to memorize them nor do we have a quiz, that our students need to abide to. The original idea to have a set of our own codes was to make sure we have a good learning and practicing environment for our student. It also reflects our value system. For people who are thinking of joining our Wing Chun class, please read the codes first to see whether you agree or not before making any inquires. This would save precious time for all of us. I am not young any more and my health is not as good as before, therefore my attitude of choosing the right students has become more cautious and selective. I want to focus my time and energy on the right students. 1. Be respectful to the school, classmates and yourselves. 3. Watch out for your classmates' and your own safety during training. 4. Only use your Wing Chun for the right purposes such as self-defense and protecting loved ones. Abstain from using the Art in pointless fights or unlawful conducts. 5. There would always be someone better, so be humble and not to publically talk bad things about other schools or styles; especially on Internet. 6. Students should respect each other and to maintain a harmonious training environment together. 7. When a new person joins the school, there is 3-month probation period, only when this new person passes the probation he or she can become a student of the school. 8. Students who miss classes continuously for over two months will loss his or her student status automatically, i.e., this person will not longer be a member of the School. Any former students who want to re-join the class will have to re-apply for admission. Coach will evaluate case by case to approve or disapprove the application. 9. In the event of a serious violation of above Codes, the student will be expelled immediately and/or will never be allowed to return the School. 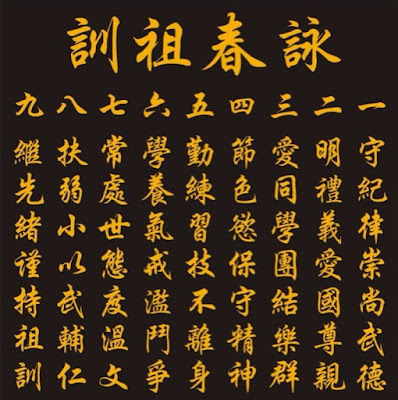 【傳承】『台北詠春拳』認可的教練名單 List of Coaches of "Taipei Wing Chun"
I think that Ip Man's Wing Chun Code of Conduct such as the Ten Commandments of Christianity may be outdated here and there, netherless most of the rules match human commmon sense. So why not let the Wing Chun students learn the rules in their own language. I'm very happy to see a Chinese version of the Code of Conduct which seems to be the same as the original engraved on a stone tablet in the Ip Man Memorial Hall in Foshan. In the west, a lot of Wing Chun schools are proud to present a Chinese English oder Chinese German, Chinese French... version with some strange Chinese wording. My guess is that the initiator of this very widespread western Chinese version has misread or misinterpreted some of the charancters. Best example for my theory is the last line: The Chinese text seen above says: "Carry on the ancestral heritage, take care to hold up or maintain the teachings of the elders." The widespread western Chinese version says: "Carry or continue Emperor Guangxu, Han (Chinese) hold or maintain the teachings of the elders."